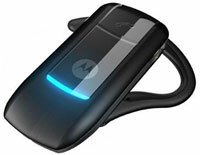 Motorola RAZR H3, a Bluetooth headset from Motorola which originally designed for Motorola RAZR V3 mobile phone. However, it can be used with wide range of devices that support Bluetooth 1.1 or 1.2. The headset weighs 19g, with talk time of up to 8 hours and standby time of up to 150 hours, plus superior audio quality, and an ergonomic futuristic design. treocentral reviewed Motorola RAZR H3 and rated the Bluetooth headset 3 out of possible 5. They concluded the Motorola RAZR H3 headset is a good choice for RAZR mobile phone users or Treo users who want a futuristic-looking headset. It has decent sound quality but suffers from some usability issues with the action button. You also pay for its good looks. If I could give half-star ratings, this would be a 3.5 star headset.